Japan offers different kinds of passes and cards to make traveling within regions and across the country easier for foreign visitors. 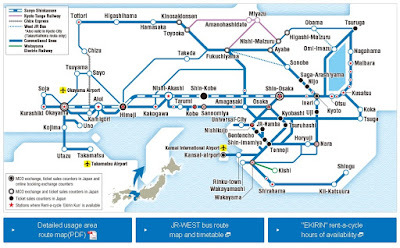 One of the options you have when you visit the country is the JR Kansai Wide Area Pass. This allows you to explore Kansai and other areas. I used this pass recently and came up with a list of places you can include in your itinerary. The map above shows the stops and lines you can take using this pass. I found it convenient and good value because I got to use bullet, rapid and limited express trains that reduced travel time between places. I also wanted to see destinations outside the Kansai Region, which made this regional pass a good option. Once you have the pass, all you need to do is to show it to the station staff once you enter and leave. Upon first use, they'll stamp it with the date of expiry. This pass is only valid for 5 days and is limited to JR Line trains and certain others specified in the link West JR. Here are some of the places I visited using this pass, maybe you can add them to your itinerary. The first place I would recommend is the UNESCO-listed Himeji Castle. Its distinctly white color gives it a simple yet majestic appearance. The castle grounds' garden and paved walkways make for a leisurely stroll. Himeji is beautiful from all angles. Entrance Fee: JPY1000, I recommend you get the combo ticket that includes Koko-en Garden for JPY1040. How to Get to Himeji Castle: Get on the shinkansen bound for Okayama. Alight at Himeji Station, the castle is a short walk from here. Entrance Fee: JPY1040 for the combo ticket with the castle. How to Get to Koko-en: Board a bullet train bound for Okayama or Hakata then alight at Himeji. The garden is next to the castle and is a short walk from the station. Okayama Castle was built in the 1590s but the destruction caused by World War 2 didn't spare it. The castle you'll see now is only a reconstruction. The beautiful black exterior with the blue sky and autumn foliage make for a good photo op. Entrance Fee: JPY560 combo ticket which includes Koraku-en. How to Get to Okayama Castle: Take the shinkansen bound for Hakata or Okayama, then alight at Okayama Station. The castle is a 20-30 minute walk from the station. Koraku-en is recognized as one of the three best landscaped gardens in Japan. It is the main attraction of Okayama. I was able to visit during autumn and the trees and leaves were at their most colorful. It was a cool but overcast afternoon, but the trip was still worth it. Despite the crowds, you can find quiet spots to enjoy the garden. Entrance Fee: JPY560 for the combo ticket which also includes the castle. How to Get to the Garden: Board a bullet train bound for Okayama, once at the station, you can walk to Koraku-en. Combine it with a trip to the castle. Kurashiki's Bikan Historical Quarter is a preserved canal town that dates back centuries, the Edo Period to be exact. The quarter is like an open air museum where you can still get a glimpse of its past as a rice distribution center and storehouse. The storehouses lining the canal are now cafes and shops. How to Get to Kurashiki: Your first stop is Okayama, take the bullet train to the latter's station. Then switch to another line to reach Kurashiki. The Bikan Historical Quarter is just a 10 minutes' walk from the station. I was still unsure about going to Kumano to do the pilgrimage trail. I then decided to just visit Wakayama, since the day trip to the trail takes too long for just a day trip. I took the train to Wakayama City and decided to go to its castle as a half day trip from Osaka. Toyotomi Hideyoshi had the original castle built in 1585. However, the castle wasn't spared from World War 2. Most of the structures you'll see now are just reconstructions. Despite this, Wakayama Castle is still a noteworthy addition to your itinerary. The park is a great place to see cherry blossoms in the city and take pictures of the autumn colors. How to Get to Wakayama Castle: Board a train bound for Wakayama (I took one from Tennoji). After you reach the station, you can either walk or take the bus to the castle (I walked it wasn't too far). Osaka Castle is one of the most recognizable and famous landmarks within the city. You'll spot it immediately once you inch closer to its gates. The garden provides a green space amid the concrete jungle where you can enjoy a couple of hours stroll or jog with views of the castle. How to Get to Osaka Osaka Castle: You can get to the castle using the JR Pass by getting on a train on the JR Loop Line within the city. Alight at Osakajokoen Station, then walk to the castle grounds. Arashiyama in Kyoto is another possible inclusion to your itinerary using the JR Kansai WIDE Area Pass. I decided to visit this part of one of my favorite prefectures in Japan because I wasn't able to do so during a previous trip. Tenryuji is a UNESCO-listed heritage site, one of the many in Kyoto. This temple is also a great place to take pictures of autumn's colors. Entrance Fee: JPY500 for the garden only, you can buy a combo ticket while here, if I remember correctly it was JPY800. The Togetsu-kyo Bridge is one of Arashiyama's most recognizable landmarks. There's always a long line of people crossing it. The Bamboo Forest wasn't what I expected, it wasn't even very long and there was just too many people. How to Get to Arashiyama: Take the JR Train (local or otherwise) to Kyoto Station, after reaching your stop, switch lines and alight at Arashiyama Station. Some of the attractions such as the bridge, bamboo forest and Tenryuji Temple are within walking distance of the station. I was unable to go to Nara the first time I was in this region, so I went this time around. The city is an ancient capital, it played an important role in Japan's history. There are many UNESCO-listed temples you can visit during your stay here. You don't have to enter some of the temples, the grounds allow you to get a good look at them from the outside. If you were to enter just one, I would recommend Todai-ji, here you'll see one of the biggest Buddha bronze statues. The entrance to the Great Hall is JPY600. How to Get to Nara: Get on a train bound for Nara from Tennoji Station. It takes around 30 minutes. One section of the attractions are within walking distance about 20 minutes; the temples of Tofukuji and Todaiji, the deer park and Kasuga Shrine are within walking distance from each other. Prince Shotoku founded Horyuji Temple in 607. It has the world's oldest surviving structures made of wood. It got UNESCO World Heritage status in the early 1990s. How to Get to Horyuji Temple: Board a train bound for Nara from Tennoji Station and alight at Horyuji. The temple is within walking distance from the station. I decided to walk, took around 20-25 minutes one way. 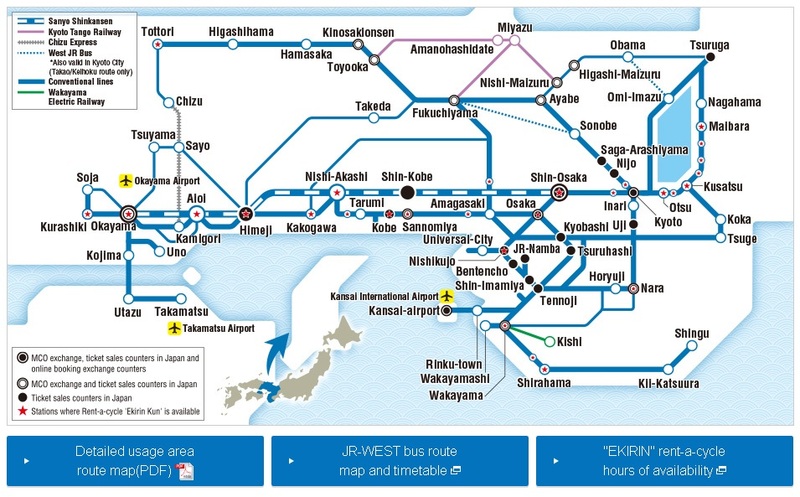 These are some of the places you can visit using the JR Kansai WIDE Area Pass. There are several other stops you can make with this pass.